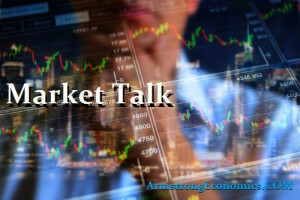 The energy price rally was again the reason given for positive equity markets around the world and Asia benefited also. The Hang Seng (+0.9%) performed the best, but only just edging out the +0.8% rally seen in the KOPSI index. Retail tech and financials helped the run, whilst currency movements also play their part. The USD continues to show a strong recovery making gains against core (displayed via the DXY) but making exceptional moves against many EM countries. Although we see the occasional pullback, the longer term trend remains in place. EM debt has been slow for a while with many players now side-lined since banks retrenched from positioning paper. Trading large size EM debt is extremely difficult and in some markets almost impossible to move a portfolio. With currencies also in play, indicated ranges are more extreme and size transparency a shot in the dark. This is not being helped by 10yr treasuries trading around a 3% coupon, which we have not seen in over seven years. The Nikkei was helped by a weaker Yen, but sadly not the SENSEX which closed with a small loss even though the INR saw an early attempt at the 67.50 level. Most of the European talk this morning, surrounded the Bank of England rate expectation and the US inflation data to be released lunchtime. The morning saw Sterling make good ground as some expected action at noon, but as we now know – they were soon to be very disappointed. Upon the unchanged announcement and the 7:2 BOE split Sterling lost all gains and more in afternoon trading. It did bounce fro its lows top close down 0.2%, but had by then lagged way behind the Euro’s +0.6% rally of the day. US number were marginally weaker than expected which put a bit of a dampener of European bourses at the close. CAC and DAX closed +0.2% and +0.6% and impressive with the added Euro gain. However, not so confident in Italy where the FTSEMIB closed down around -1.5% on fears of a Euro sceptic government. Inflation data missed by 0.1% which helped dip the 10yr treasury yield back below 3% again and helped flatten the curve again. The data along with the 211k initial claims saw stocks gain momentum as the day progressed. Futures markets were already indicating a better open and we seemed to get renewed enthusiasm returning to the tech sector as we go. Much of the talk this afternoon was that the FED and the markets are very much in tune and is proving irresistible for some fund managers who are returning and looking for value. What is does highlight is the difference between FED policy and the ECB’s difficulties. The capital flow remains into the US Dollar and even looks to be accelerating. We will be watching Fridays closes for confirmation of trends and looking at next week for confirmation of these moves. Japan +0.06%, US 2’s closed 2.53% (u/c), 10’s closed 2.97%, 30’s 3.12% (-4bp), Bunds 0.55% (-1bp), France 0.79% (u/c), Italy 1.93% (+6bp), Greece 4.03% (-11bp), Turkey 13.13% (-15bp), Portugal 1.7% (+1bp), Spain 1.3% (+1bp), and Gilts 1.43% (-3bp).